This game was about to happen long time ago and I would like to thank Gatti for being extremely patient and keep the busy schedule open for some Kings of War action! I was really looking forward to it because first, we haven't played against each other for ages and second, because he has accumulated a very substantial amount of experience with KoW already. I was sure then I would have a great opportunity to learn a lot and that it would lots of fun too! 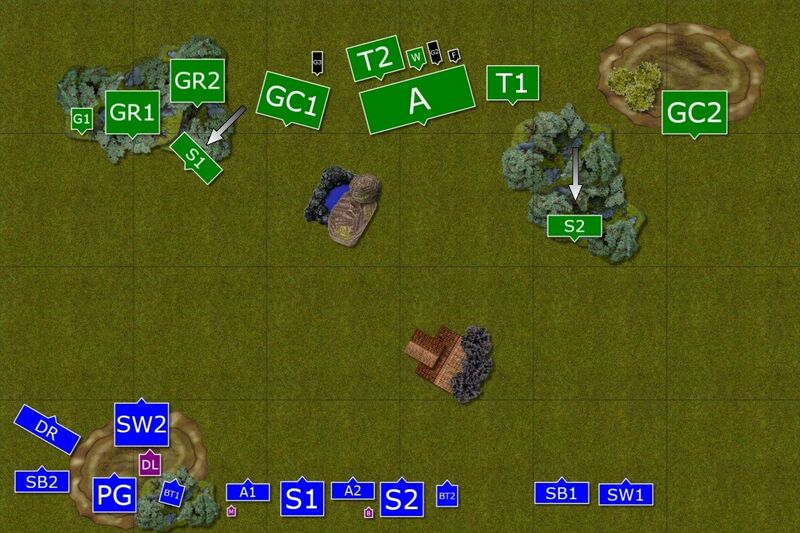 At this stage all armies are very new to me and it is hard to make detailed plans against them. However, I want to use the opportunity and discuss them a little to see if I can assess their capabilities correctly. First of all, the army wide rule is called Tribal Might and means all units, unless noted, have Crushing Strength (1). It means that my best armored units will take damage on 4+ and infantry at 3+. I consider that a powerful rule because CS is not affected by the terrain, for example, and even cavalry units charging through the forest or similar will still hit hard enough. Ax - this unit looks like the main anvil of the army as hordes have high nerve value and they are also defense 5 so they will not be easy to harm. They have bigger foot print too which, in my opinion has some advantage and disadvantage at the same time. On one hand it is harder to avoid such unit as they arc of sight is significantly larger and it can block or control more space. On the other it is more difficult to maneuver and avoid terrain that might affect the damage output. 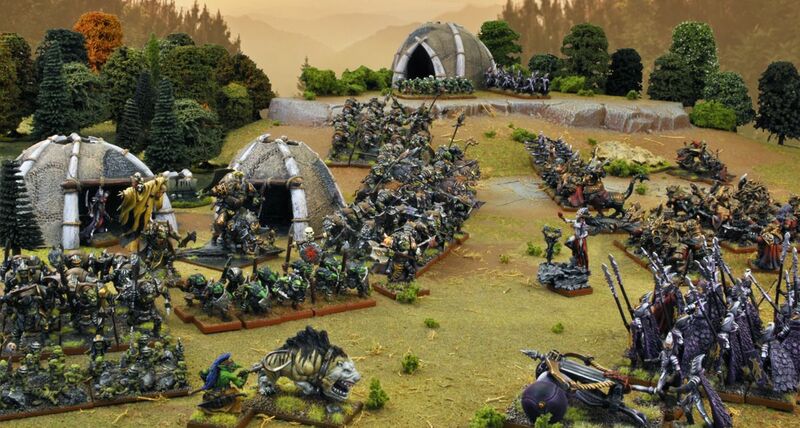 While it seems to me that hordes have primary role to be the anvil I think that in the case of Orcs they also should be used aggressively to take the most out of their army rule. Hence, any negative modifier that affects their offensive potential is to be avoided. I must say that hordes still look quite intimidating but maybe I should try and charge these, even frontally, with 3 units at the same time and see how they can handle that. 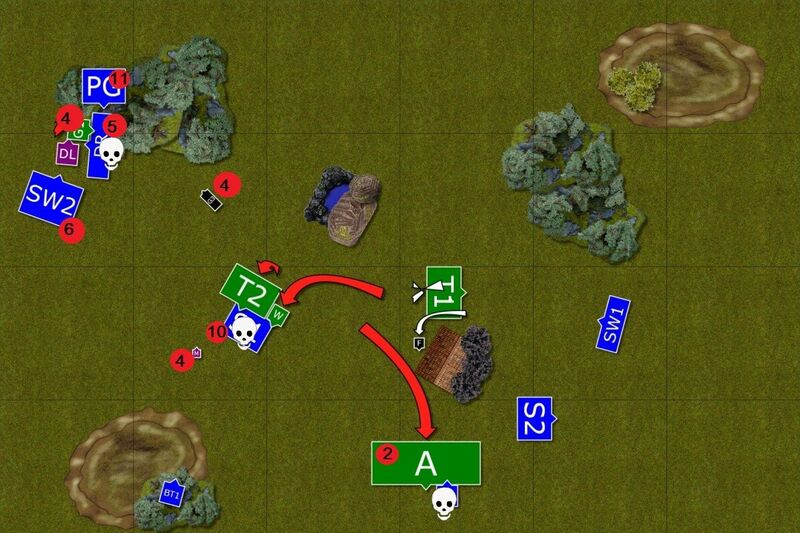 Skulks - these troops have completely different role. They are the shooters of Orc army but they will probably look for other troops as targets to maximize their chances to do some harm. They also vanguard so can pick these targets easier and will be sacrificed as living shield for sure. Faster than regular infantry they will be positioned to be as annoying as possible! War Drum - it's a very intriguing addition to the army list. It provides great support because units in 6" will have +2 to their waver and rout nerve values. That is fantastic news indeed and will make Orcs much more resilient. Fortunately for me there is only one drum in the army but I think I should try to destroy it if possible to make the whole battle line weaker. I am sure it would be well protected though. Gore Riders - Orcs version of the heavy cavalry. Quite fast with movement 8, hit on 3+ and defense on 5+ make them look like knights of other armies. The advantage they have is that they are CS(1) and TC(1) so if not hindered they will do damage as any heavy cavalry but will still hit hard even if that happens. One unit has Pathfinder while the other is as fast as Stormwind cavalry so outmaneuvering these regiments will not be easy. Godspeakers and Flagger - there are only two sources of Inspire in this army so I was curious if that is going to be an issue at all. Both godspeakers are mounted meaning they will be mobile enough to get into range for spells casting, whatever they will choose. They have default fireballs that are handy for the army with not much shooting. Even more so with the additional rule that allows them to cast 1 more dice per each horde that is in 6" from them. Hence, Fireball (9) may as well be Fireball (10+). Trolls - two more powerful units that can do both, absorb some damage and then hit hard in return. Faster than infantry can also, I think, fill the gaps in the battle line when cavalry charges forward while infantry needs time to keep up the pace. Regeneration in combination with good nerve (especially close to war drum) makes them hard to shift. At the same time they have relatively small foot print so that they can also maneuver with greater flexibility. Gore Chariots - two regiments of chariots are quite dangerous too. Fast enough to hit before infantry, still good defense, slightly different footprint than cavalry. Seems like quite a few hammers in the army which means they can push forward aggressively, go for some exchanges and still have units to hit back. Chariots can be both here, the bait that cannot be ignored or the counter attacking regiment. At least their nerve is lower so there might be a chance to rout them with some shooting. Giant - after encounters with Bone Giants I must admit these guys are tough. What makes them even better is the fact they can sneak in to the flanks easily, can't be wavered and are hard to rout with high nerve and good defense. Plenty of such troops in this army. In general, my impression is that this army is quite fast, has very good defense across the board (makes me want to bring more bane chants and CS units) and plenty of units that can hit hard. I wanted to try and use my shooting to get rid of the Skullks so that they don't interfere with movement phase and possibly harm some chariots in the process too. There are some changes I made in comparison to the army I took last time against Empire of Dust. Main reason for changes is to try and play with the force I simply like. I always thought Elves are combined arms force and decided to include units of different profile. I have a little bit of shooting in the form of two bolt throwers, 2 troops of archers and 2 of light cavalry. That should allow me to pick the targets easier but also focus on a single unit if needed. I don't expect these units to rout enemies on their own but either denting the foe before the melee or finishing damaged units at range is an option here. Of course smaller units with lower nerve can be routed with shooting alone. I have some hard hitters too that are a little bit faster than the enemy but I will need to be careful with how I use them. Ideally it would be great to combine charges but we will see if I can position all the pieces to execute one. 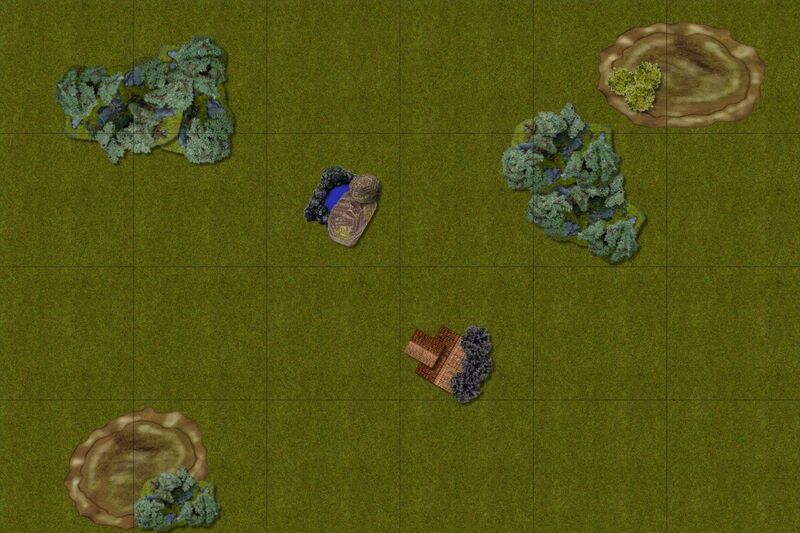 I must say the way terrain interacts with units in KoW is very important. Because armies tend to have many elements it is also more difficult to see the formation of the enemy before you deploy your forces so one needs to anticipate it by reading the terrain. That blocking piece in the middle was not a good thing for my opponent as in general he has regiments with wider frontage and maneuvering around it will take him more time. First of all let me apologize for the lack of deployment order but it seems I lost part of the chat and can't recall what was deployed when. I can tell you, however, that Gatti started with Skullks and then deployed units in the center. I started with archers and spears and I think we both tried to see which flank will be stronger. In the end, Gatti deployed his cavalry on my left and I had to choose where to deploy drakons and stormwind regiment. 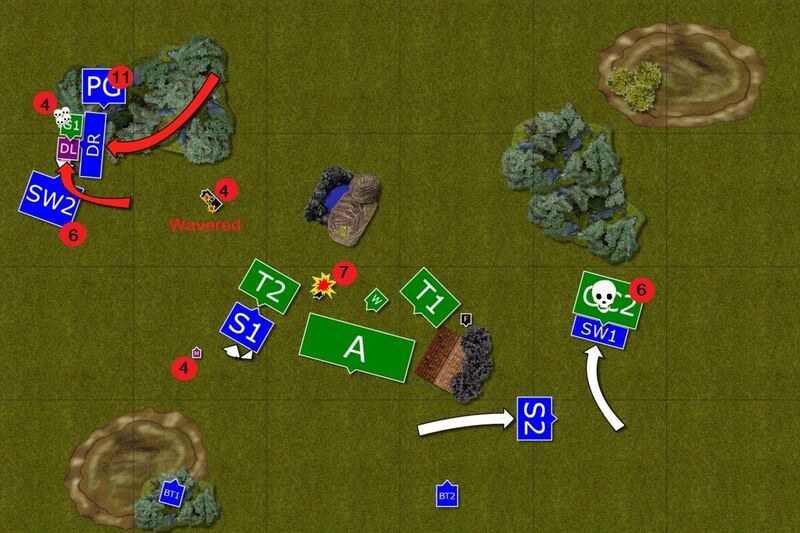 I decided to deploy on the left flank because I could delay hordes in the middle to win that flank. Skullks moved forward as anticipated. I won the roll off and chose to move first. Elves moved forward anxiously. 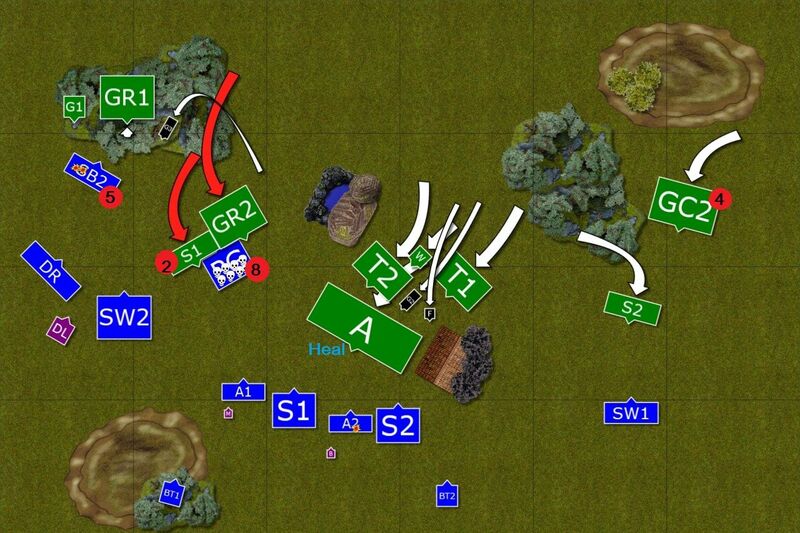 Only the left flank moved forward, the rest of the regiments stayed where they were unless absolutely necessary. The shooting was with mixed success. 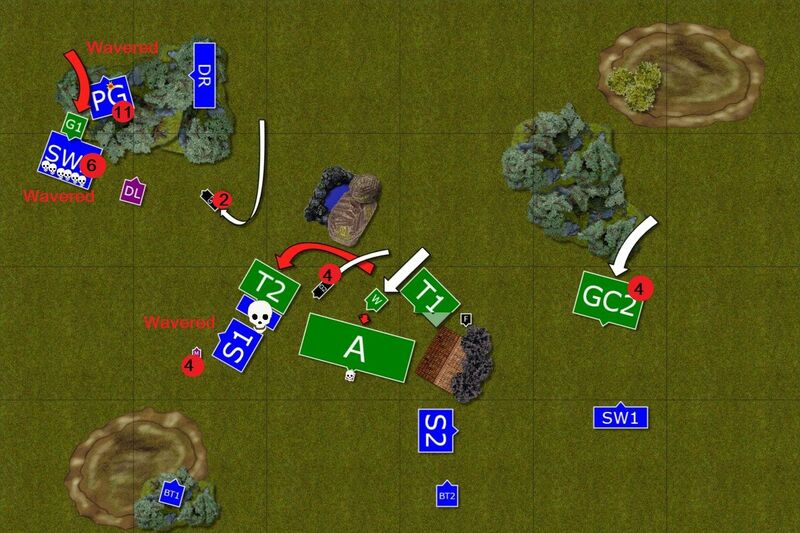 On the left flank skullkers wavered that resulted in some confusion in the woods. 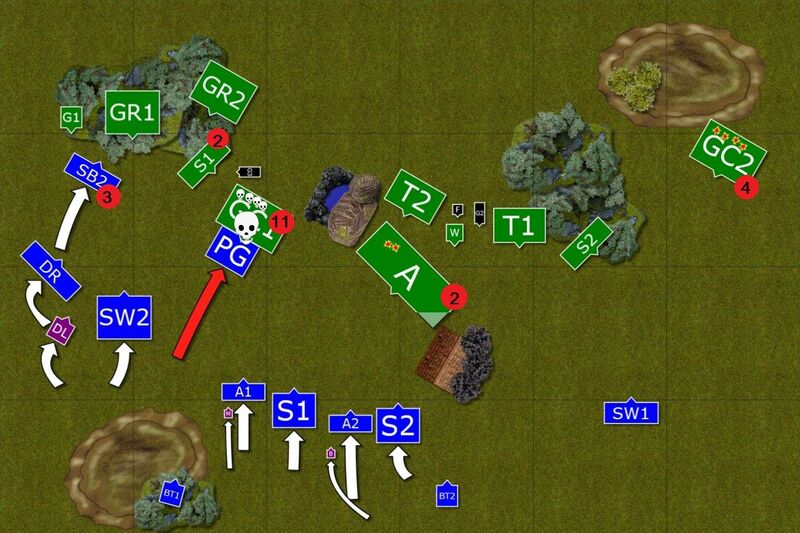 But the charioteers didn't care and skullkers on the right flank avoided hits completely. Because of the wavering Skullkers in the woods, the Orc cavalry could not roll to the positions properly and only chariots advanced aggressively, being healed in the process by accompanying godspeaker. The rest of the army moved fast through the center, horde of Ax leading the way. On the right flank SKullkers inflicted a few casualties but it proved to be enough to rout Elven fast cavalry (Edit: Gatti rolled 11 fore nerve here!). 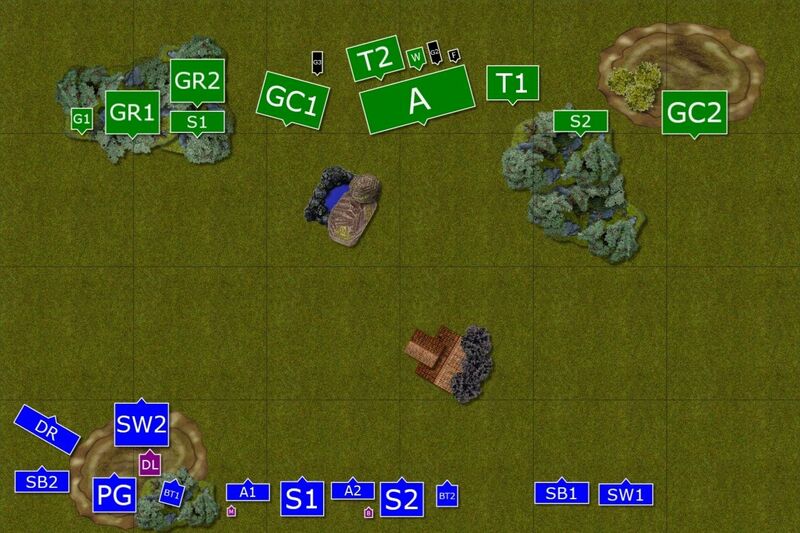 Units on the left flank advanced a little with fast cavalry posing as a very obvious bait. They shot at nearby Skullkers and wavered them again. The rest of the Elven shooters aimed at the Chariots, inflicted much more substantial damage this time and ... another unit of Orc army wavered! Orcs continue their march through the center. 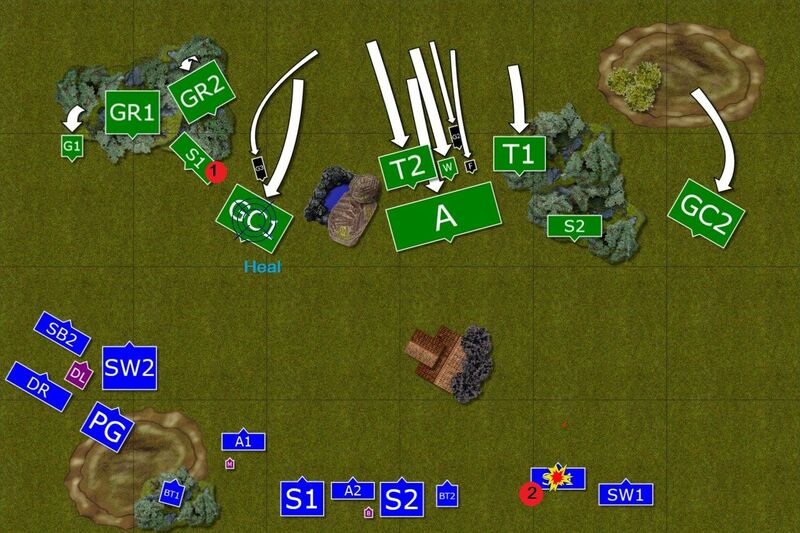 With now two regiments blocking their way, the cavalry on the left flank could not do much. Only godspeaker tried to remove the annoying cavalry with well placed fireball but Elves refused to retreat. In the center horde was going through the narrow passage toward Elven center and the second line of trolls followed. 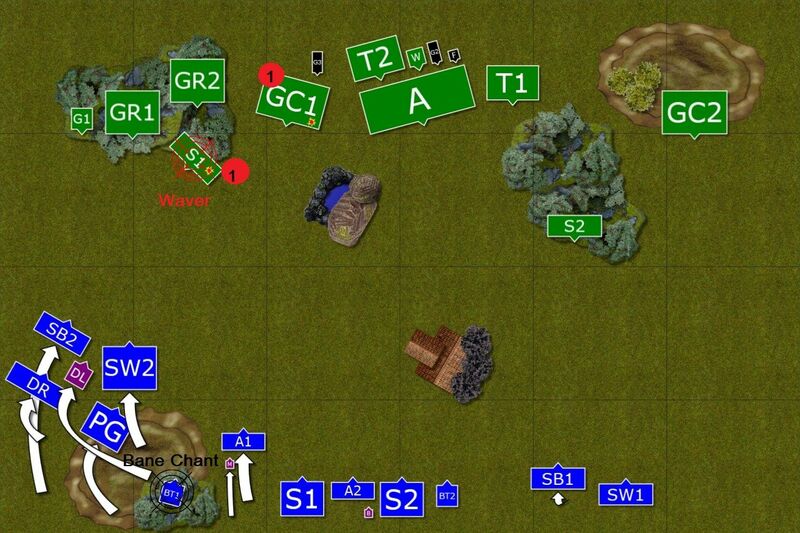 Units on the right flank continued their slow movements to move in and out of enemy charge range. Using the opportunity, Palace Guard charged the damaged chariots and routed them completely. Which was very handy as the mage could not enhance their offensive capabilities (Edit: I failed to cast Bane Chant.). Fast cavalry moved forward again, blocking the advance of a giant and one of the riders regiment so that the rest of the Elven troops could set u a counter charge. The targets for shooters were generally blocked so they aimed at the horde. Only the Bolt Thrower on the right flank could choose better and another regiment of the chariots was damaged. 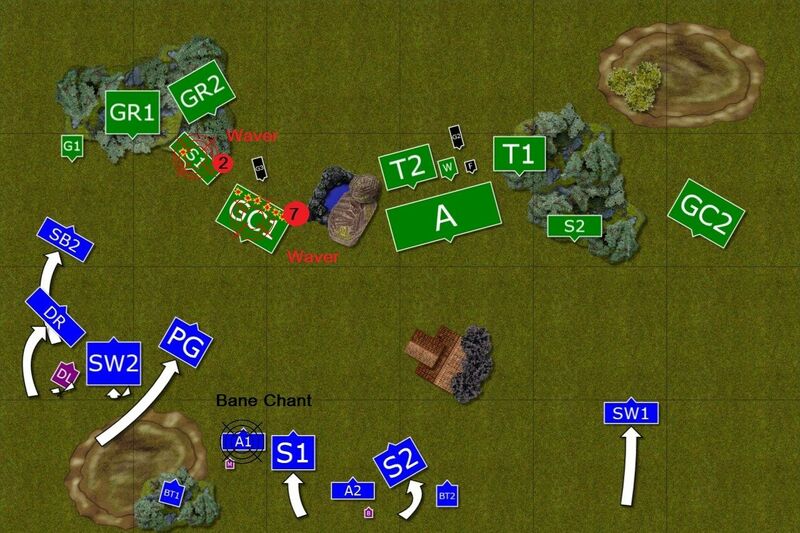 Counter charge on the left flank. Skullks and Gore Riders charged exposed Palace Guard but despite inflicting quite a substantial amount of damage they didn't manage to rout the Elves and that left both units in a vulnerable spot. The other unit of Rider and a Giant didn't take the bait and moved out of the charge range. Godspeaker was supposed to get rid of the fast cavalry this time but he still could not make the Elves rout. The horde was now upon the Elven center and they had to come up with some plan B fast. 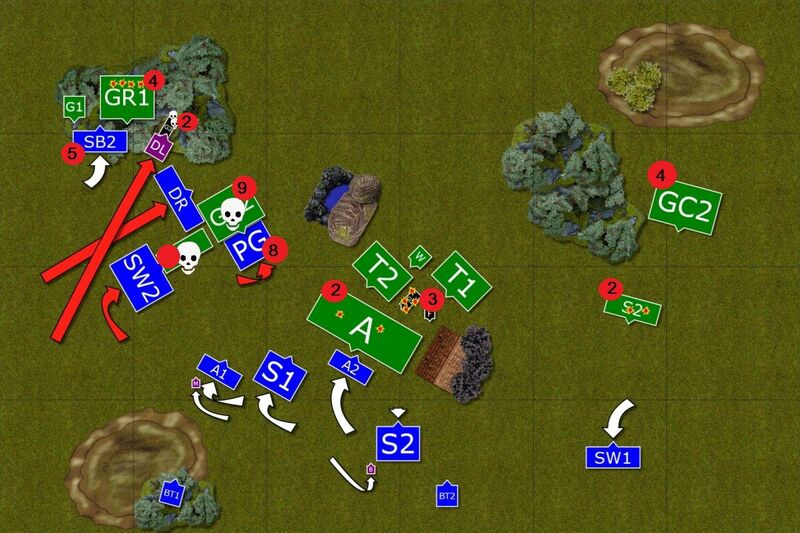 Elves attacked on the left flank. Fast cavalry blocked the giant and one regiment of riders and even inflicted significant mount of damage upon their enemies. 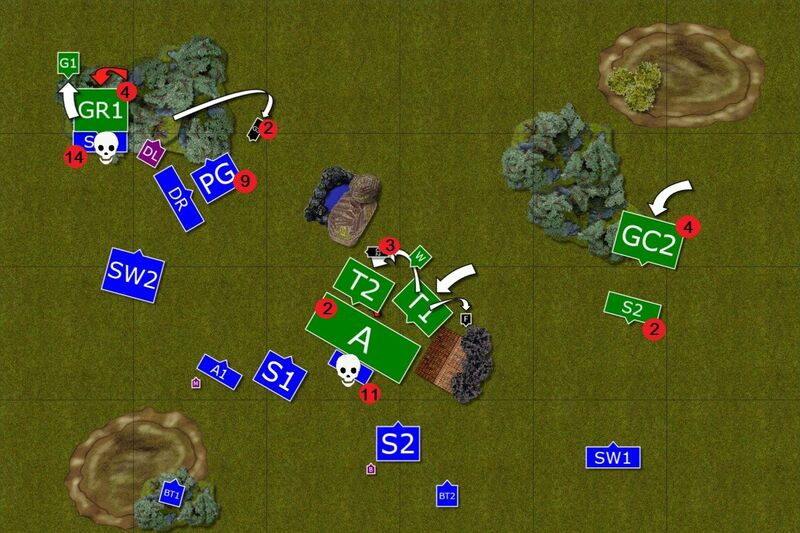 Counter charge of Palace Guard, Drakes and heavy cavalry destroyed two enemy units too. Drakon Lord tried to scare godspeaker but it didn't work this time. The regiments in the center tried to slow down the horde a little bit longer but it was clear there will be casualties soon. Bolt thrower on the hill singled out second godspeaker and the other one aimed at skulkers but the damage was not serious enough to impress the orcs. Ax Horde attacked foolish archers that blocked its way and destroyed them in no time. On the left flank, gore riders removed fast cavalry while nearby godspeaker tried to finish off damaged Palace Guard but elite elven infantry didn't want to give up yet. 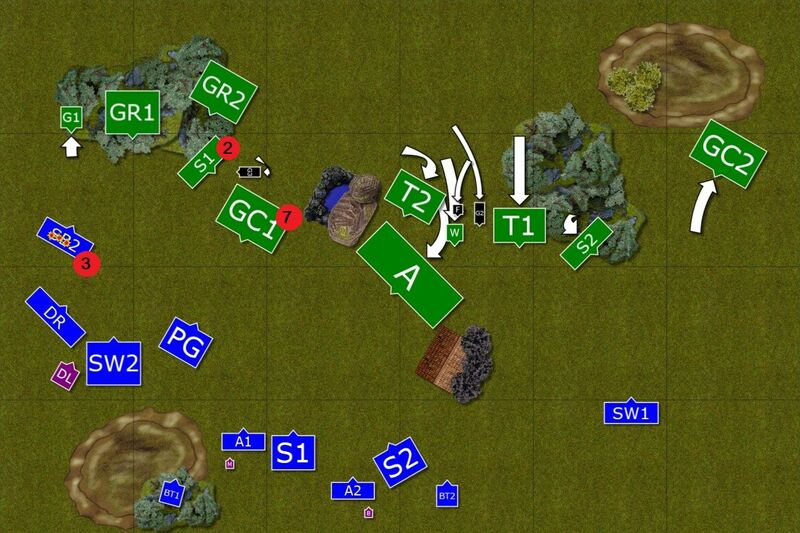 Would the center hold long enough for the flank forces to prevail? Heavy cavalry and Palace Guard both charged the Gore Riders and didn't give them any chance. Only Giant was left to hold Elven forces. On the right flank Skullks were finally routed and heavy cavalry would have their chance to destroy chariots soon. The archers one more time tried to get the godspeaker but were not successful. Orcs pressed harder! The Giant managed to waver heavy cavalry so they were out of action for a while. Horde destroyed valiant army battle bearer that was heroically trying to buy more time for the troops to move away. Archers also paid ultimate price to shield Spears from troll attacks. Finally, fireball wavered Elven mage but the other godspeaker could not finish off Place Guard. They kept holding on despite the odds! Heavy cavalry on the right flank had their first and only chance to charge the chariots. They attacked without delay and although the damage was not as big as hoped it was still enough to destroy the enemy regiment. On the left flank the fliers took over wavered troops once they pulled back to make room. But the forest and giant's toughness ensured it was all fine and ready to counter charge. Lucky shots managed to get one godspeaker and waver the other one though! Orcs wasted no time to push again. The giant counter charged the drakons and routed them despite the inspiring presence of their lord. Spears could not hold against the trolls and war drum attack. Last but not least the horde destroyed one of the pesky bolt throwers and that ensured that no army could claim even the narrowest victory. Both armies, bloodied and exhausted, disengaged. We rolled to see if we are going to have turn 7 but it was not be and the battle ended! I was very glad to find out I got a draw against a very experienced player in my 3rd game of KoW ever! I really liked my army this time and I hope I am moving towards right direction. I am sure there are many things I need to improve and I would love to hear your suggestions. Here are my conclusions from this game. I was actually happy with the composition as it allowed me to have a mix of different elements and while I haven't used them to the full potential I think I did much better with this force than the ones I used in my previous two games. I am still trying to decide how many and what elements I would really need in the army. I am sure it will be further affected once I started playing scenarios but at the moment I want to play a few more games with the basic version to learn the ropes. I would like to think the deployment was not too bad. I had the advantage on left flank and I managed to win there, left some troops to counter the right flank and luckily managed to win there too. The idea with holding the center was not too bad but I guess I messed up during the game. I will talk about it in a minute. On the other hand I keep wondering if I should not use spears on both flanks in aggressive manner. Having one unit on the right wing would allow me to move forward more decisively and even face a chariot charge. But then I suspect Gatti would send one horde of trolls to tip the balance into his favor. As I said, it was my 3rd game ever so it might be no surprise I moved in a shy way. I am not sure how I could force better outcome on the left flank. Gatti did well to prevent my fliers from landing behind his lines but then it resulted in very shy movements on that flank. I got lucky with Palace Guard, in particular when they held against initial charge because I was not well positioned with my cavalry to counter if they were routed. The biggest question for me, however, was about what I did turn 3. I thought I might evade the horde and the trolls if I slowed them down with archers. However, I didn't manage to move one unit of Spears to safety anyway. I was wondering then what would have happened if I actually attacked turn 3. I didn't hope to be close to inflicting substantial damage but if I attacked with all archers and spears I could potentially fit 4 units against ax horde. Now that would stop the trolls from coming after me as they cannot charge through units. And horde would be able to hit one unit at a time while I could continue attacking next turn. I may have lost 3 units in the process but at least I would have prevented the enemy from breaking through the center too early. Of course they could still move through it (at least one unit of trolls) but I simply wonder about it. Another option was to deploy Spears in the center so that archers were grouped closer to the hill. I would then move a little bit earlier with Spears to intercept the horde and then had clear line of sight for a little more shooting. Last but not least, the charge against the giant. Until Orcs turn 6 I was leading. But unlucky nerve roll on Drakons (double 6 followed by 9) saw them routed. I could simply charge with the Drakon Lord alone and block the Giant from charging wounded cavalry. His better nerve would see him holding his ground while I didn't have good odds at destroying the giant on the charge. At the same time I was lucky to keep Palace Guard alive because the amount of fireballs thrown at them was huge but they were either not hit or Gatti rolled low for the nerve. Speaking about it I also think I made an initial mistake with positioning of my BSB because I should have assigned them to cavalry units on the right flank were he could help fast cavalry to stay alive. Very nice bat rep. I like the way you are showing accumulated damage on each unit - the key statistic in KOW. 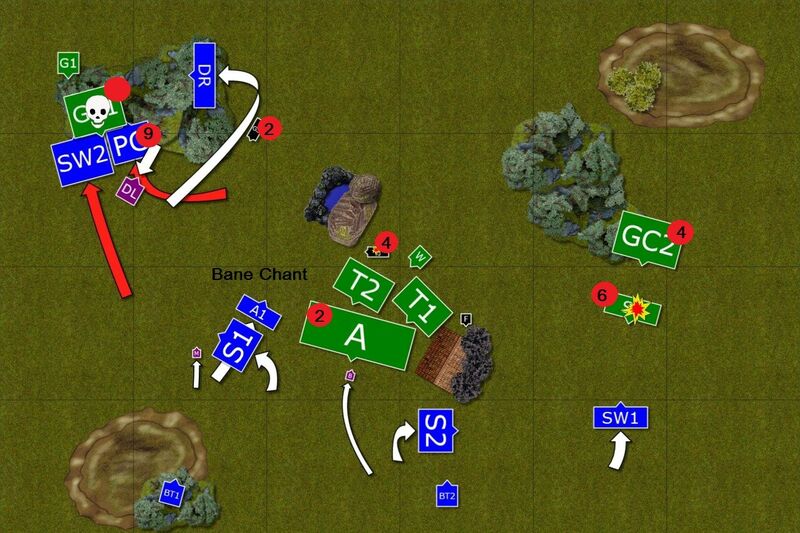 From the map it looks like it was clear turn 3 or 4 that your left wing would win and you could have diverted forces to the centre. It probably didn't feel like that at the time, though! Your list worked well and has an MSU quality that is a nice hangover from WFB. I find the extra characters, war machines and monsters that hordes buy you make them almost an auto choice in the armies I've tried (Dwarfs and Empire of Dust), so it's good to see a list that doesn't need/use them. I am glad you like the extra damage counters. It does not take long to make them but I think they show that vital information that allows the reader to assess the situation better. It is not only good to have it to see if some nerve roll was "lucky" or not. But it also tells you if it was more risky to commit particular unit as it may have gotten destroyed in a counter charge. I really hope I can keep that MSU-ish feel. I just like more elements in the army! The fact that hordes unlock much more than regiments and cost less makes them very tempting choice. I still get that advice that I really should take one :) But I think it will be possible to do well without it too. I will definitely play more games with troops and regiments and I must say this was the first game where it felt good to have all these elements I fielded so I hope it is a sign I am going towards the right direction! Looking at the lists I thought you would get a shoeing. I think you played fantastically against a strong list. I think your list would benefit from fewer troops. Thanks, Jonah! I am glad you liked the report and thanks for kind words! I was definitely happy to get a draw against much more experienced opponent and it is also good to know the victory was possible. Although I hope to have more elements in the army I am still at the stage where all is new and I am learning my way around. Hence, I would be very grateful if you could share some details on how do you think my list could evolve.